Today’s lesson in art history comes from Bondi Beach, about a half-hour north of Sydney. Whereas others might be inclined to post a photo of the beach itself, and the stunning views of cliffs and turquoise water, I’ve chosen instead to show you some better than average graffiti. As you can see, “Grunt” is a bulldog. He has been memorialized on a cinder block wall of a coffee shop, just off the beach on a street with no name. Grunt took my breath away for two reasons. 1. The work is extraordinarily good. Zoom in. Note the detail around the eyes. Eyes are tough to get right. 2. Years ago, I dated an artist in New Jersey named Anushka. Anushka was seriously talented. She also happened to have a bulldog named Grunt that she liked to sketch on napkins and paper placemats. Anushka had a habit of leaving from time to time, and returning without a lot of explanation. She wanted to see the world, and early in 1994, she and Grunt hit the road and never came back. I haven’t seen or heard from her since. Is it possible? Could I be standing in this random alley in another country, 10,000 miles from the place I last saw an old girlfriend, looking at a picture of her dog that she herself drew on public property? Is that kind of coincidence even worth contemplating as something larger? 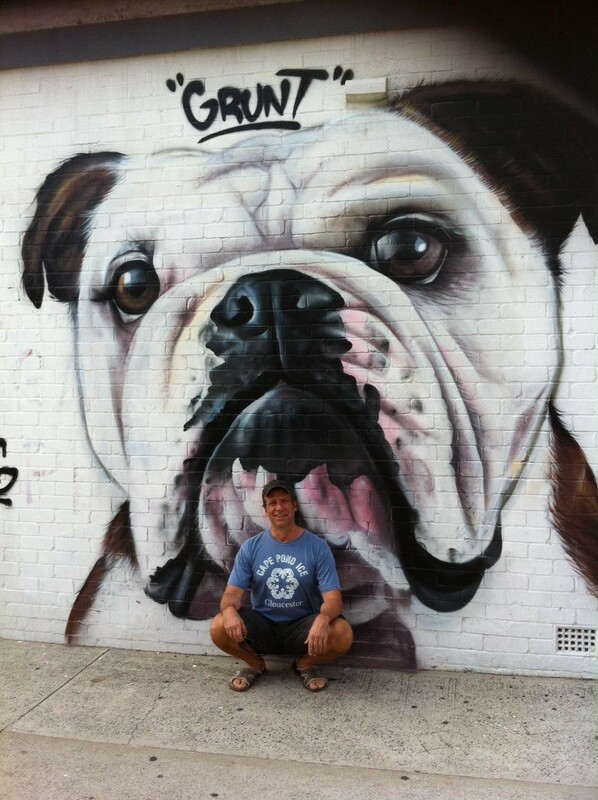 I know, there are probably other artists out there who once owned a bulldog named Grunt, but the list can’t be very long. I asked around the coffee shop but no one knew the artist, or how long it had been up there. Weird. Now, I find myself scanning the crowds at Bondi, and looking over my shoulder as I walk the streets of Sydney. Is she here? Was she ever? Maybe I should go back to the coffee shop, and make a more thorough inquiry? Or maybe, I should just let sleeping dogs lie. Either way, Grunt was a good boy. Nice to see him again.